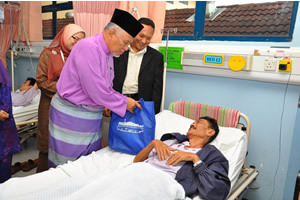 BANGI, 7 Aug 2012 – The Federal Territory Religious Council and the National Mosque last week presented hampers and cash to patients of hospitals in the Ferderal Territory and the National University Medical Centre (UKMMC) in conjunction with the current fasting month. The Chief Imam of the National Mosque, Tan Sri Dato’ Syaikh Haji Ismail bin Haji Muhammad gave away hampers and cash to patients in the pediatric and surgery wards of The National University of Malaysia Medical Centre (UKMMC) in Cheras on Wednesday while Chairman of the Religious Council, Mejar Jeneral (B) Dato’ Seri Jamil Khir Bin Haji Baharom gave away donations to four hospitals in the Federal Territory including UKMMC on Thursday. Assistance from the National Mosque is part of its annual programme taking turn to visit various hospitals in the Federal Territory and Selangor. Head of the Industry and Community Partnership of UKMMC, Asso Prof Dr Noorazah Abdul Aziz said as a referral centre it receives patients from all over the country and the visit by the National Mosque delegation and the assistance given can bring patients closer to mosques while creating a closer bonding between the mosque and the hospital. The Federal Territory Islamic Religious Council on its part has given out cash and equipment assistance totaling RM1.86 million this year to 709 patients suffering from cronic diseases at four hospitals in the territory up to last July. The Council has also allocated RM9.1 million a year from the Zakat Fund to help patients from the territory needing haemodialisis treatment. Mejar Jeneral (B) Dato’ Seri Jamil Khir, who is also Minister in The Prime Minister’s Department gave out the Hari Raya assistance to patients from the four hospitals in the territory at the Dewan Sekapur Sirih, University of Malaya Medical Centre. He gave out cash totalling RM800,000 to the Patients’ Welfare Fund of four hospitals – RM250,000 each to UM Medical Centre (UMMC), UKMMC, KL Hospital and RM50,000 to Putrajaya Hospital as well as hampers and medical equipment. Dato’ Seri Jamil Khir said the Council carries out an annual assistance programme during the fasting month to those eligible under its Medical Assistance Scheme. He said the Council will continue to provide assistance to the eight groups of people eligible for help from the Zakat Fund and will ensure that none from the group will be left out. The effort compliments the government’s assistance programme to help the needy in the Federal Territory of Kuala Lumpur, Labuan and Putrajaya, he said.